Our range is 50' long, we offer 12 lanes with electronic target carriers. Once you purchase a lane there is absolutely no time limit. At Bull's Eye we allow silhouette & situational targets (bad guys doing bad things). We have Glocks, M&P's, Sig's,1911's, Ruger's, Springfield's, Heizer, FNH, and revolvers 38 special to 454 Casull. 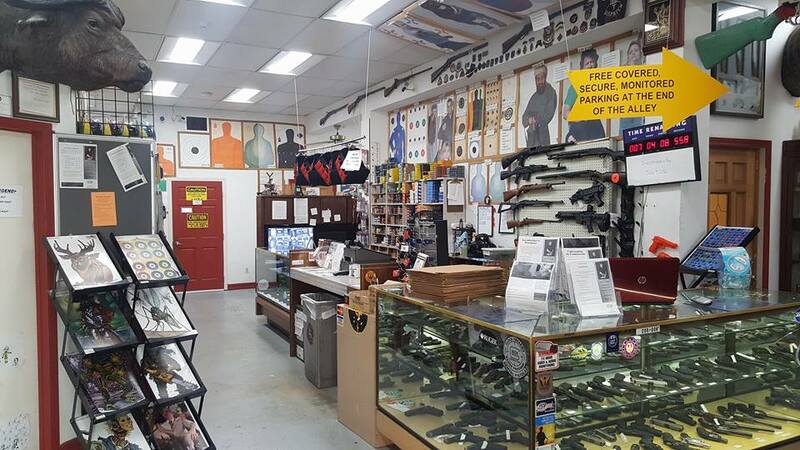 Being mainly an indoor pistol range we have a selection of shotguns (only Buck there is no Birdshot or Slug allowed on our range), and 22's on our wall for rent. We do allow AR's cambered in pistol calibers, or 300 Blackout, We have Frangible ammunition for sale in .223. We do not have a restriction on caliber, but on speed anything under 2000FPS will be allowed. Targets: We've changed our target system. Customers will now be able to view all targets on every wall with numbers and prices associated with them. Once the Range Safety Officer has cashed you out at the till, the customer will then be able to gather their targets before heading to the range. Rentals: Remember to bring a friend if you DO NOT own a firearm. $10.00 for access to just one pistol. $20.00 for access to all of our pistols. $35.00 for access to everything. NO TIME LIMITS, you can leave and then come back if you'd like. We cannot rent firearms to individuals that are unable to legally possess a firearm. We cannot rent firearms to any individuals who do not have their own firearm with them at the time of rental. If you are unarmed, we require a friend to accompany you on the range. This helps reduce negligent use of our weapons. Ear & Eye protection is absolutely required without exemption.